It was about a month ago, at the beginning of April, that a friend and I noticed something unusual as we cycled south on Charnelton Street. The timing was impeccable, since it was installed just in time to be admired by the wave of pedestrians who hit the streets of downtown Eugene for the First Friday Art Walk. Not only was the bike rack on the corner of Charnelton and Olive wearing an impeccably-tailored sweater, but many of the animal sculptures along the street sported jaunty scarves as well. Detail of bike-rack sweater's signature. Photo by Mary Archer. What does this have to do with bikes, you ask? (Besides the obvious fact that a knitted cover on a rack will likely protect your bike’s paint job.) Simply put, this installation was much easier to notice and admire as a cyclist or pedestrian than from an automobile. It was a special treat designed for those traveling under their own power, a reward for those who take the time to see (and smell and hear) the city at less than 30 mph. So thank you, yarn-bombers, for making it that much more fun to travel this fair city on two wheels. Let’s see what discoveries May brings! Great article! I’ll have to keep my eye out. I hadn’t noticed these yet. Thanks for adding some whimsical articles to WBE. Traditional news is good, but I hope we see more articles like this one on this website. Glad you are pleased by the combination of bikes and whimsy. It’s a funny little world, and the details can sometimes be better savored on two wheels. I “tag” things sometimes with my projects–it’s nice to know such efforts make people smile. 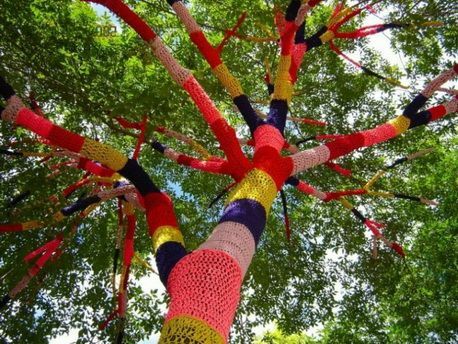 🙂 For some more truly amazing guerrilla yarn art, check out knittaplease.